What was your largest muskie in 2017? Did you meet your muskie fishing goals? As muskie anglers we all are on a quest to catch the biggest muskie. It’s not about numbers, unless of course it’s a bunch of big ones. That’s what makes muskie fishing different from fishing for other species. If you want to catch bigger muskies in 2018 and are on a quest for your personal best, there are many things that you can focus on during the frozen water period that can pay big dividends come summer. There are multiple things that can help but three areas to focus are research, inventory, and education. The amount of effort you put in directly impacts your results. Do you have a lake X? By lake X I mean a lake, river or reservoir you are fishing that few others are muskie fishing. Maybe you haven’t fished this lake X but you have heard about it, but plan to fish it in 2018. If you have such a new water on your radar screen now is the time to research the lake. Start by investigating the local Natural Resources departments records, making some phone calls or sending emails. It’s important to know such information as stocking records to predict strong year classes of muskies or anticipate when a population may be realistically fishable. Also, remember that much of a muskies lifetime revolves around spawning areas, so it’s imperative to know where the muskies spawn. This will help with both spring and fall muskie locations. Another research question to answer is when are the big muskies most susceptible? Typically there is a week or two every year when more big muskies tend to get caught on any water. That’s when you need to be there. Look at online photos from resorts or guides and note the date when the fish were caught. Checking multiple sources allows you to put together this puzzle. Believe me, determining this window of opportunity can be the single most important factor in putting success in your favor. 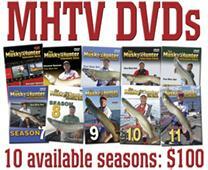 If you are attending muskie sportshows be sure and check the dates any photos you may see. While looking at photos, be sure to make a mental note of sky conditions. Do most of the muskies come from sunny or cloudy conditions? Also, you might even see a lure or two lying on the front deck, and that might provide some further clues. One last thing to consider when researching a lake is to take advantage of social media. YouTube and Facebook can be valuable tools to view photos and videos from the water you are researching. This research can be fascinating and take hours. It’s a great way to really learn everything from where you should stay, launch your boat, and ultimately where to fish and what lures to use. You can gain a tremendous advantage and can almost feel you have been to the water before you even get there! Once you have done your research and have a better understand the type of fishing you will be doing on your trip to lake X, it’s time to take an inventory of your equipment. I could be you need more of a particular lure and/or color. For example, based upon your research, rather than fishing Cowgirls, maybe you’ll need more smaller Showgirls and fish them faster. So, you might need more Showgirls in multiple colors. Likewise, review your rod and reel selection. Again, you might need a medium-Heavy action Shimano Compre rod rather than an extra heavy model to obtain maximum casting distance and feel the vibration of the smaller blades. If you are going to need to fish fast, you’ll need to revisit your reel inventory and maybe get a high-speed Shimano reel to make life easier. My point is that once you do your research, you should take the time to check out your equipment and make sure you have everything you need for the upcoming season. The last thing you want to do is go to your new lake, and not have what you need. Even if you aren’t sure what lure(s) you will need, your research will give you a general idea and you can have a better sense of what you might need while shopping at sportshows this winter. The final piece of your wintertime muskie agenda is education. We all have our strengths and there’s no need to work on those, but it’s those weaker areas that we may have previously avoided that we should try and tackle. For example if you don’t have a lot of confidence casting soft plastics this winter is the time to attend seminars and talk with muskie experts that spend hours fishing these lures. A simple conversation with a guide can really help you better understand or answer your questions that can give you more confidence in using these lures. Even if you don’t think you’ll be fishing a particular lure on Lake X, it’s always good to broaden your horizons as you never know when a new technique will help. If you can catch a couple muskies next year on a new technique you might gain enough confidence to use it more and better understand how to work it into your repertoire of techniques. 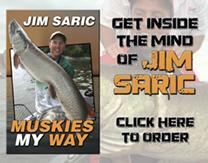 Every new muskie season is exciting as we dream of what will be. Take the time to research, inventory and educate yourself this winter and you’ll take your catches to another level. My motto has always been fish hard and fish smart, and these wintertime activities build the foundation of fishing smart.